On this 9 day expedition cruise through the Galapagos Islands you will see truly unique wildlife, up close! Traveling to several islands, with a dedicated naturalist guide, you get substantial exploration ‘range’ throughout the archipelago, all in spectacular comfort, and with terrific food! The Yacht La Pinta provides a wonderful luxury class cruising experience. The group will have an allocation of cabins on the ship with dedicated, private naturalist guides. The trip is filled with activities, like paddling, swimming, snorkeling, hiking, and provides a dose of culture and history too, with a visit to Quito, the ‘middle of the world’. Arrive at Mariscal Sucre International Airport and meet your driver to be transferred to your hotel in Quito, La Casona de la Ronda. 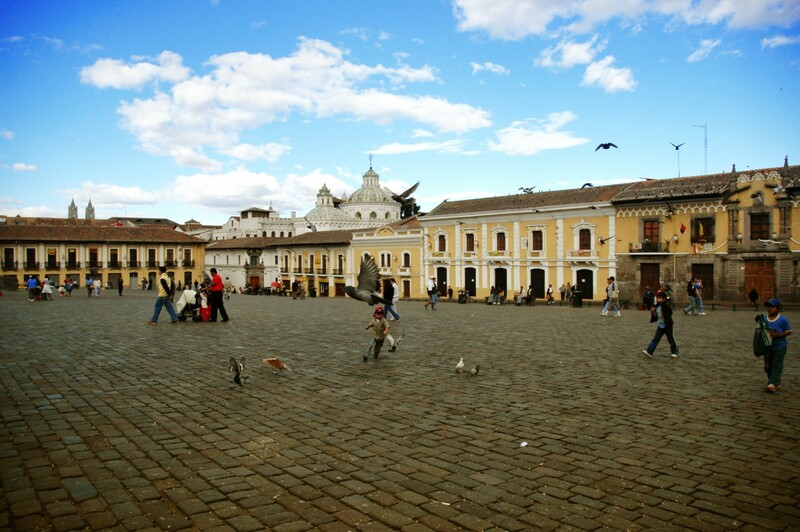 Today you will enjoy a full-day, private-guided tour of Quito and the ‘middle of the world’. We will start at the Mitad del Mundo (middle of the world), a site located just 30 minutes north of Quito, is the monument that marks the equator at its closest point to the city. Archaeological evidence shows that both pre-Inca and Inca civilizations recognised and celebrated the equinox, the day the sun is directly over the equator. In the morning we will make the 45 minute journey northwest to the equatorial line where we will walk on the rim of the extinct Pululahua volcanic crater. Afterwards you will visit the “Ciudad Mitad del Mundo” a group of buildings designed to explain the significance of the site, as well as the Ethnographic Museum or the Initñam Museum, which is located right on the Equator. Here you will have the chance to be in two hemispheres at the same time! After lunch, we will continue our tour in Quito. The place to start is Colonial Quito, a city of narrow cobblestone streets lined with whitewashed walls and, rising above, the steeples and cupolas of the city’s many spectacularly decorated historic churches. The city has one of the best preserved colonial centers in all South America and its integrity was assured in 1978 when the United Nations declared Quito a World Cultural Heritage site. 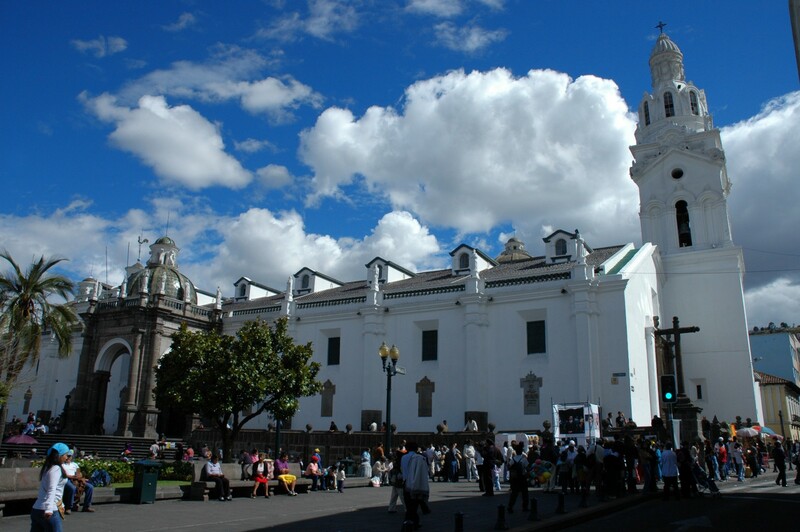 Quito is the first city ever to be named a world heritage site. First on the agenda is a walk through the Main Plaza, the Plaza de Independencia, where you will see the Government Palace, the Cathedral, and some of the most important churches built around the XVI and XVII centuries, including the monastery of San Francisco, for which building began only 5 days after the founding of the city. Fly to Baltra Island – the gateway to the Galapagos! This morning, we transfer to Quito’s Mariscal Sucre Airport and fly to Baltra Island, the gateway to the Galapagos! This tiny island was a military base during the Second World War and hosts the Islands’ principal airport. The airport was built using the most advanced environmental techniques to reduce emissions and energy use, some of which you’ll notice as you transit through the facility. It was the first ecological airport in the world. From the airport you will be transferred to the dock to board Yacht La Pinta, your home for the next week. There’s an introductory welcome briefing, boat drill, and cabin assignment followed by lunch. Following an afternoon disembarkation at North Seymour Island, we enjoy a walk along the coast and the interior of this beautiful flat island, observing numerous bird colonies as well as sea lions and land iguanas. There are opportunities for coastal exploration by dinghy. Evening briefing, welcome cocktail and dinner. This morning we visit Punta Vicente Roca on Isabela Island. Since there is no landing site at this location, the coastal exploration is by panga, while the naturalist guide explains the dramatic geology of the area, with remains of lava flows and tuff stone layers. There is abundant wildlife and, depending on the conditions of the ocean, we’ll be able to snorkel along the cliffs, hopefully in the company of green sea turtles. In the afternoon, we visit the youngest and most pristine island of the archipelago, Fernandina, one of many visitors’ all-time favourites. 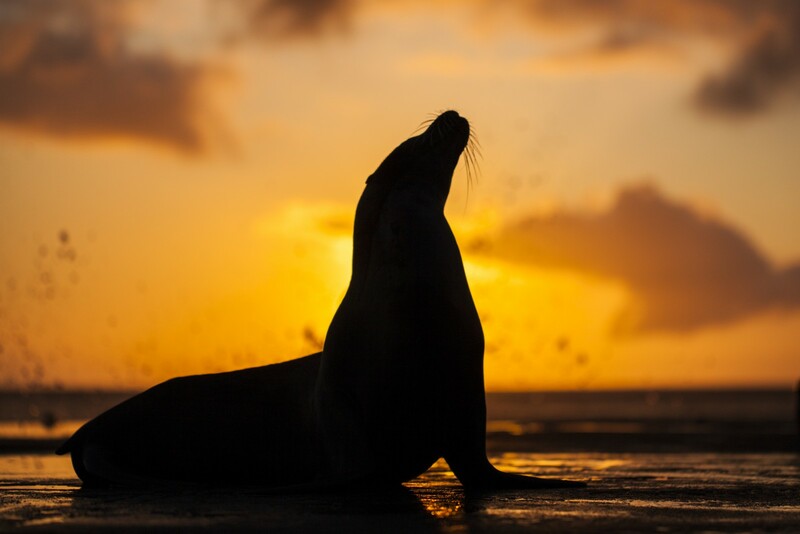 Our landing site, Punta Espinoza, has an amazing combination of barrenness and abundant wildlife. Highlights include hawks, penguins, flightless cormorants and astounding views of the surrounding volcanic landscapes. After breakfast, we disembark at Urbina Bay, on the western side of Isabela Island, the result of an uplifting of the ocean floor. Here you can see corals, shells, and large and very colourful Galapagos land iguanas, as well as (occasionally) giant tortoises. Navigating the Bolívar Channel, there are good chances of spotting several species of whales. Stroll along the beach, observing marine iguanas, mockingbirds, and more! In the afternoon we visit Santa Cruz Island. The north shore of Santa Cruz Island hosts the fascinating landscapes of Cerro Dragon (Dragon Hill). Our walk includes circling a brackish water lagoon frequented by lagoon birds, while further inland, the trail offers a beautiful view of the bay and the western islands of the archipelago, as well as the chance to observe land iguanas. The morning’s visit heads to the Charles Darwin Research Station and the giant tortoise pens within an impressive giant prickly-pear cactus forest. These are the Galapagos’ headquarters of scientific investigation, conservation and the National Park administration. A delicious lunch is served at the poolside of the Finch Bay Eco Hotel. After breakfast, we land at Post Office Bay (Floreana Island) to visit the historic barrel that has served as a post office in the archipelago for over two centuries. Panga rides along the maze of channels on Floreana’s north shore can also be enjoyed. Views from La Lobería and the Baroness Viewpoint are quite rewarding. There’s great kayaking and swimming from the beach as well. 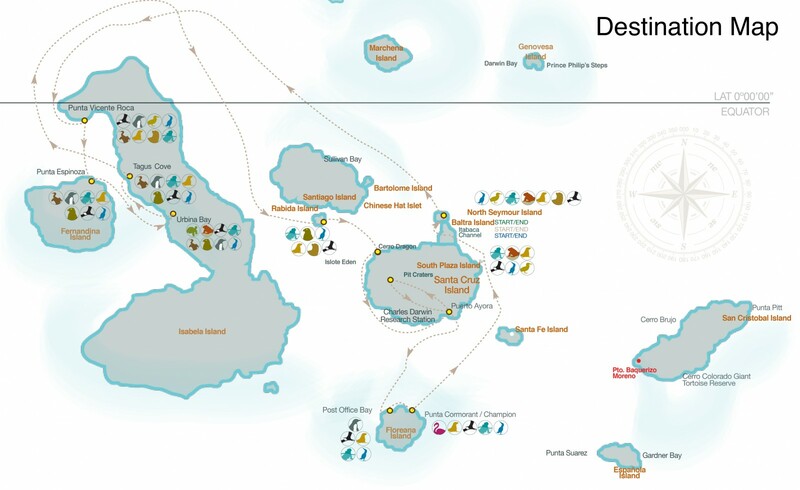 Before disembarking at Punta Cormorant on Floreana Island we can snorkel or ride our glass-bottom boat along the coast of an extinct cone called “Champion Islet”. Later in the afternoon, our visit to Punta Cormorant takes in an olivine-crystal beach for an easy walk by a brackish water lagoon where bird species like american flamingos may be observed. On the other side of the island, we come to a white-sand beach where sea turtles come out at night to nest. Our journey ends at Baltra Island, where we transfer to the airport to take the flight back to Quito to catch your international flight home. La Casona de La Ronda Boutique Hotel is located in the Historical Centre of Quito Old Town. Many guests describe the hotel as “an oasis of tranquility on arrival in Quito”. The hotel is passionate about its guests. We give genuine, warm smiles and truly want our boutique hotel to become a home away from home for our guests. Set in a colonial style house built in 1738, the hotel’s rooms are very bright and are decorated with stylish wooden furnishing. Guests can enjoy relaxing in the hotel’s garden and on the terrace. A sophisticated upscale travel experience that combines modern design, spacious rooms, and gourmet cuisine with top adventure. The ship offers a wide variety of aquatic activities including snorkelling, kayaking and a glass-bottom boat. She’s a distillation of the wish lists generated by captains, expedition leaders, hotel managers, and guests over many years. Yacht La Pinta boasts among some of the largest cabins of any Galapagos expedition vessel and features floor-to-ceiling oversized panoramic windows in all cabins for the best views of the islands. Stylish bathrooms with top-notch amenities in all cabins. Join our guides in the lounge for nightly briefings about the next day’s activities. In between outings, it will feel as if your connection with the islands never ends, as panoramic windows in our numerous social areas offer almost permanent visual contact with the island landscapes while you are inside the ship. Or step outside with your camera and make the most of the numerous outdoor social areas, including an outdoor terrace for dining when weather permits and an observation deck that is perfect for equatorial stargazing. Relax in the hot tub, work out in the cardio-gym, or lounge on the sun deck. The cost for the T’19 International Adventure in Croatia is 1,775 EUR per person based on double occupancy. Should you wish to have your own cabin, we can arrange this for you with an additional single supplement of 887.50 EUR. Please note: The captain retains the right to modify the sailing route at any moment. Due to specific requirements in some of the harbors, it is possible that ships will be tied sideways to each other and that passengers will need to transfer from one ship to another in order to get to the coast. Please be careful when transferring from ship to ship, and should you need assistance the crew members will be glad to provide assistance. Dinner: In Croatia there are many bakeries, so you can eat a pizza slice or something similar for dinner for 2-5 EUR. At a restaurant, a typical dinner will cost 10-25 EUR. Drinks: In Dubrovnik at a local restaurant a beer is ~ 5 EUR. The rate is a little bit lower on the islands. On the boat, a beer is ~ 3 EUR. On the boat you can pay just with cash, but in most restaurants credit cards are accepted (American Express is not accepted everywhere). Although Croatia entered the EU on July 1, 2013, they still have their local currency, Kuna, which is accepted everywhere. EUR is accepted only in some restaurants and bars. The Adriatic coast has a pleasantly mild Mediterranean climate with a large number of sunny days. In August you should expect high temperatures of about 82 F (28 C) and lows of 62 F (16 C). The weather tends to be quite hot and dry in August. Note – this list is not comprehensive; it is meant to be a guideline to help you prepare for the trip appropriately. It is the responsibility of all travelers to ensure that proper travel documentation is in place. All countries require a valid passport (with at least 6 months’ validity). Contact your local embassy or consulate for up-to-date visa requirements. (American residents, click here for the State Department’s latest outline of travel documentation requirements). Travelers should consult a family physician or your local travel clinic for up-to-date health information and any requirements for vaccines. More information can be obtained from the ISTM by clicking here. Or, contact your country’s Health or Foreign Affairs department. Proof of out-of-country medical insurance is included in your Dartmouth College medical plan. Be sure to bring whatever documentation / contact numbers are required for your Dartmouth medical plan should you need medical assistance in Croatia, so you can ensure the insurance coverage is properly activated. Terraficionados also recommends Cancellation & Interruption insurance to protect your travel investment. If you need information or a quote for travel insurance please email christopher.clark@terraficionados.com. The Republic of Croatia is at the crossroads of Central Europe, the Balkans, and the Mediterranean. With more than a thousand islands off the Adriatic coast, Croatia is a “Jewel“ in the Mediterranean region. The country is an adventure-lover’s paradise, blessed with rugged mountains, crystal clear lakes and rivers, rugged canyons, and miles of pristine coastline. Croatia is divided into 20 counties with its capital city, Zagreb, being the economic, transport, cultural and academic centre of the country. Zagreb is the only metropolitan area in Croatia with a population of over one million. You are probably far more familiar with Croatia than you realize, and we have Game of Thrones to thank for it. Seasons 2 and 3 showcased Croatia’s most famous city, the walled seaside fortress of Dubrovnik, which was chosen as King’s Landing. Filming has since expanded to other Croatian cities, including Split, which is home to a Roman emperor’s retirement palace. Croatian food and Croatian cuisine are different from one region to another. For a small country such as Croatia, it is unusual to see such a rich culinary tradition, but geographical position and historical events have left an impact on the country’s cuisine, and people in Croatia are very proud of this heritage that they nurture and enjoy on a daily basis. The coastal region is characterized by the influences of the Greeks, Romans, Illyrians and later Mediterranean cuisines – Italian and French. It features many seafood specialties (squid, cuttlefish, octopus, shrimp, lobster…) prepared in various ways. A trip to Croatia offers breathtaking natural beauty, great swimming, lots of history, interesting architecture, incredible wine, delicious seafood, and warm, friendly and unpretentious people.